The Florida Gators will be without two starters in the 2015 Birmingham Bowl on Saturday as interim head coach D.J. Durkin announced Wednesday that wide receiver/kick returner Andre Debose and defensive tackle Darious Cummings will not be with the team, ending their Gators careers. According to Durkin, Debose is healthy and eligible for the game but decided to mutually part ways with Florida prior to the contest. Cummings is suspended for the bowl for a violation of team rules. “We had two guys not make the trip with us – Darious Cummings and Andre Debose. Those will be two guys that won’t be participating in the game. Darious Cummings was a violation of team rules and Andre, it was just kind of a decision he made and a mutual agreement that he would be moving on with his career,” explained Durkin. A five-star prospect expected to be a breakout star for the Gators, Debose ends his career never coming close to living up to the hype. The sixth-year senior missed the 2009 and 2013 seasons due to injury but nevertheless accounted for just 540 yards on 30 receptions with four receiving touchdowns (all in 2011) for his playing career. 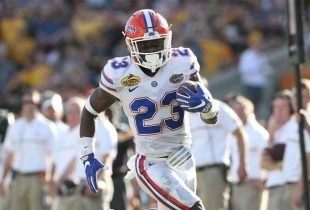 He was able to flash his athleticism for Florida in the return game, however, tying an SEC record and setting a school mark with four kickoff return touchdowns; Debose also returned a punt for a touchdown in 2014. Cummings transferred to UF from East Mississippi Community College ahead of the 2013, playing in 22-of-23 games over the last two seasons. He started six contests as a junior and 10 games in 2014, recording 45 total tackles (eight for lost yardage) with three sacks, six quarterback hurries, an interception, a forced fumble and three pass defenses. 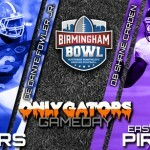 Florida’s opponent in the Birmingham Bowl, the East Carolina Pirates, will be without two defensive starters as nose tackle Terry Williams and safety Domonique Lennon were ruled ineligible, head coach Ruffin McNeill announced on Sunday. The Gators and Pirates will square off at Legion Field in Birmingham, Alabama, at noon on Saturday with the game set to air live nationally on ESPN. This is going to be one ugly bowl loss. Bring on McElwain! Simply because Debose more than any other 5 star that has come thru this program and under performed draws such ire from the fans and local media simply because Urban hexed him with the “next Percy Harvin” quote. That is single handedly the reason he catches so much flack. Get over it, Gator fans. You hate Urban, you’re taking it out, still, in part on Debose. Disagree with you. To say the main reason DeBose has underperformed, underwhelmed and has ben a major dissappointment is that Meyer jinxed him is ludicrous. If you would have said it was due to the many injuries, maybe but still not good enough. I think it was a combination of the injuries and the poor coaching and player development at the WR and QB positions we have suffered for the past 5 years. I am including Meyer’s last season as it was obvious he was not the same coach that year, it seemed he was going through the motions with no passion. Also disagree that this will be an ugly loss for us. Sorry to hear about Andre not playing this Saturday. I’m sure his teammates are as well. Good luck Mr. Dubose. We enjoyed watching your flashes of brilliance. Adam, what exactly does “mutually parted ways” mean? I’m guessing Debose didn’t want to risk injury. Can’t really fault him for that. It’s a meaningless bowl game and a chance to see the younger players in action. Not like it would have made a difference anyway since he has so little impact on offense. That is the only thing I could guess, but still doesn’t make much sense. Mutual parting yet they have lots of respect for each other is weird. I can’t imagine there are many if any NFL scouts looking at him either due to an overall unremarkable career, unless he thinks the NFL will take him strictly as a return specialist. As few players as are allowed on NFL rosters, you don’t find a lot of rosters that have room for a dedicated spot like that at least that I have seen. So be it. Frankly, I’d rather see more from the younger players anyway. “Out with the old. In with the new”. Less plays for Dunbar, Westbrook, & other unproductive seniors, as well as guys who have given notice (Fowler, Jones, Moore), would be fine w/me. We’ll find out soon enough if Durkin’s “just like we’re going to play for a championship” talk holds true. I’m not buying it. He should let Mac see what he’ll have to work with win or lose. Does anyone really care if they finish 7-5 or 6-6? Either way it’s disappointing & something we all want to forget (like almost the entire Muschump era/error). Sure the Nfl won’t mind you quit on your team.Does anyone give these kids advice?Id hope they have some sort of career coaches given the backgrounds some of these young men grew up in.